Whispers in the Loggia: Don Bosco's "Kids"
Earlier today, the 26th general chapter of the Salesians opened in Rome with a Mass celebrated by the community's Rector-Major, Fr Pascual Chavez (above, back to camera). Among the characteristics the Salesians say they try to embody are "a welcoming attitude", "optimism and joy", "creativity and flexibility" and a "deep trust in God". They pride themselves on what is called the "preventive system" of education that was devised by Don Bosco and is based "entirely on reason, religion and loving kindness". It is "preventive" in that it "seeks to prevent the need for punishment by placing the child in an environment in which he/she is encouraged to be the best one can be". Salesians will point to the fact that they tend to blend in with the ecclesial customs and style of the places where they work - all in harmony with the local expression of the hierarchical Church. It is all tempered by a "cheerfulness" and what even Don Bosco approvingly called a "recklessness" - anything whose aims were "to gain souls for God". If you thumb through the Annuario Pontificio, the Vatican's block-like 2,400-page directory, you will see that nearly every major section of the Roman Curia has at least one or two officials, staffers or consultants with "SDB" or "FMA" after their names. And most of those in top positions owe their promotion to the current Pope. For example, the Secretary of State is not the only Salesian cardinal to head a Vatican office. Pope Benedict made Don Raffaele Farina SDB, 74, a cardinal last November after promoting him to head the Vatican Library five months earlier. His induction to the college means there are currently five Salesian cardinals, two of them created by Pope Benedict (Cardinal Joseph Zen SDB of Hong Kong is the other). Cardinal Miguel Obando Bravo, 92 [sic -- Obando is 82], retired Archbishop of Managua, capital of Nicaragua, and Cardinal Oscar Rodríguez Maradiaga, 65, Archbishop of Tegucigalpa, capital of Honduras, are the other two Salesians who currently wear red hats. It is likely that the man who currently ranks second among Salesians at the Vatican will also be made a cardinal in the next consistory, whenever that should be. Archbishop Angelo Amato SDB, now in his sixth year as secretary (second in command) at the Congregation for the Doctrine of the Faith (CDF), is expected to be moved in the coming months to head another Vatican office, such as the Congregation for Saints or Catholic Education. Archbishop Amato, 69, received his current job from the then-Cardinal Joseph Ratzinger, who chose him in 2002 to be his top aide at the CDF. Amato replaced his Salesian confrère, then-Archbishop Tarcisio Bertone, whom Cardinal Ratzinger had picked for that same job in 1995. Since becoming Bishop of Rome, Pope Benedict - most likely in consultation with his Secretary of State - has continued to place his trust in people from the vast Salesian network. Last October he named Carlo Di Cicco, a 63-year-old former student and employee of the Salesians, as assistant editor of the Vatican newspaper, L'Osservatore Romano (the Salesians have for years managed the Vatican's printing press and publishing house). But the Salesian influence does not stop there. 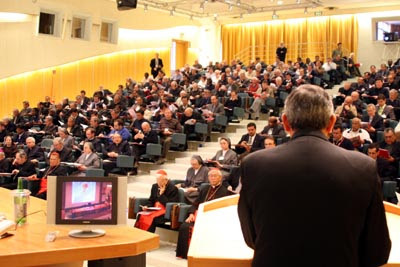 When bishops from around the world gather in Rome next October for the synod on the Word of God, they will be using a working document prepared for them by Fr Giorgio Zevini SDB, dean of the faculty of theology at the Pontifical Salesian University in Rome. One highly regarded Salesian who took up a key post in the Vatican even before the Ratzinger pontificate began is Fr Norbert Hofmann SDB, yet another of his order's Biblicum-trained scripture scholars. Since 2002 the German-born priest has been number three at the Commission of the Holy See for Religious Relations with the Jews. "No effort should be spared when the Church and the papacy are at stake," Don Bosco loved to repeat, obviously influenced by the turbulence of the period and his personal friendship with the much beleaguered Pope Pius IX. This early support of the papacy did not go unrewarded. Just four years before the founder died, he saw one of his prize pupils, Giovanni Cagliero, appointed bishop in Argentina in 1884. The first Salesian bishop later became Pope Pius X's delegate to Costa Rica and Nicaragua and, in 1915, the fledging religious order's very first cardinal. The Popes have also bestowed "celestial" honours on the Salesians in equally impressive measure. Eight members of the "Salesian Family" - including Don Bosco and Maria Mazzarello, foundress of the women's branch (FMA) - have been canonised, while 116 others are included in the gallery of "blesseds". There are 28 more Salesian beatification causes currently in the works, including Don Bosco's mother, affectionately honoured by Salesians today as "Mamma Margaret". “The Sons of Don Bosco belong to the large host of those disciples Christ has consecrated to himself by his Spirit through a special act of love”, affirms the Pontiff, reminding us that the consecrated person is called to become, as did Christ, a sign of contradiction, a witness to an alternative style of life, alert to the possibility of secular influences. He defines Don Bosco as “a saint with one great passion: the glory of God and the salvation of souls”. Every Salesian is called to maintain this passion, by understanding, studying, loving and imitating the saint of young people. The Pope invites Salesians to “overcome the dissipation of energy in hyperactivity and cultivate the unity of a spiritual life through the acquisition of a profound sense of the mystical dimension and a sound asceticism” to nourish apostolic commitment and guarantee pastoral effectiveness. Lectio Divina, the Eucharist, and a lifestyle which is simple and moderate will help the consecrated Salesian to strengthen the response to his vocation. He sent a call to the entire Congregation to “devote its attention to strengthening the proclamation of the Christian message, the presence of the Church and Don Bosco’s charism” in the western world where vocations are falling and challenges to evangelisation are rising. Benedict XVI invites Salesians to present the attractiveness of the consecrated life to young people, making explicit reference to the role of the Salesian brother. A sudden outbreak of violence and "state of emergency" in Armenia kept the community's best-known member -- the Secretary of State Cardinal Tarcisio Bertone -- from beginning his weeklong tour of central Asia yesterday. Even so, the "Vice-Pope" kept away from the opening festivities, deferring to the Vatican's "Prefect for Religious" Cardinal Franc Rode CM, who also delivered a greeting at today's session, and fellow-Salesian Archbishop Angelo Amato, the #2 of the Congregation for the Doctrine of the Faith, who celebrated Saturday's closing liturgy of the delegates' pre-chapter retreat.